"To protest for our rights is not only a right it is our obligation! Today I go to the United Nations. Venezuela our call is to a nonviolent and peaceful protest. Today I go to the United Nations for my human rights. Human rights belong to us, they are not negotiated and are enshrined in our constitution and in the United Nations." 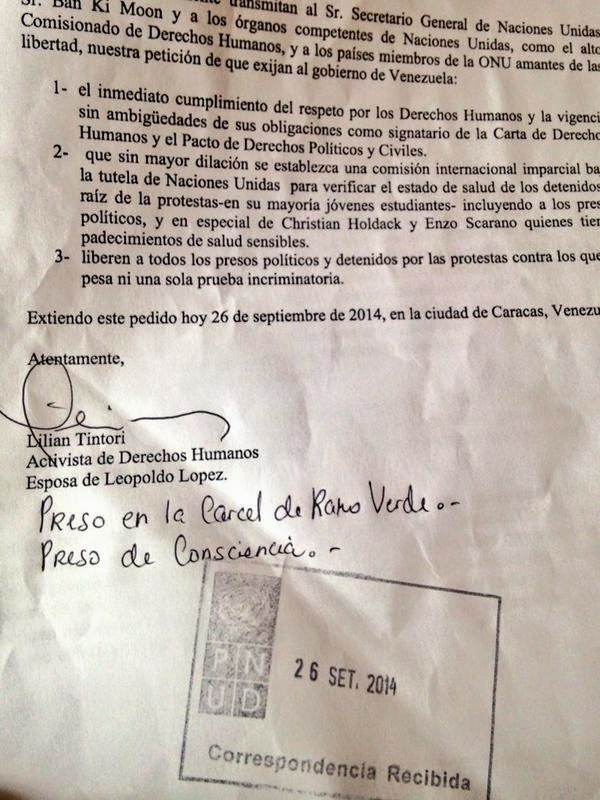 In Caracas, Lilian Tintori met with United Nations officials and turned in the above letter demanding the release of political prisoners and measures to restore human rights and democratic norms in Venezuela. 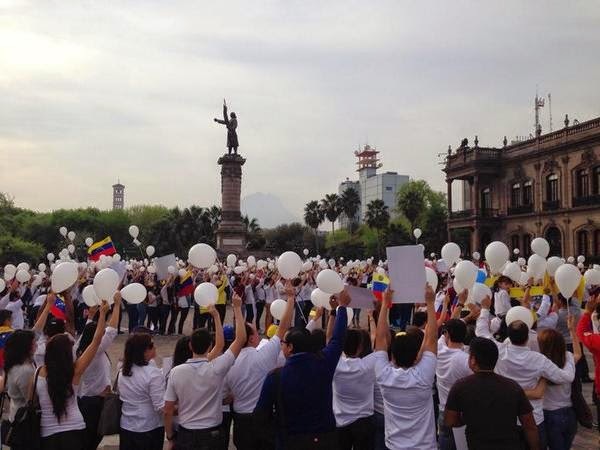 Demonstrations in solidarity with these demands also erupted in Mexico. In recent days the systematic decline in and violation of human rights in Venezuela has called the attention of the Organization of American States and The New York Times. The Office of the Special Rapporteur for Freedom of Expression of the Inter-American Commission on Human Rights (IACHR) on September 22, 2014 expressed "its deepest concern for the deterioration of the right to freedom of expression in Venezuela in light of the recent events that took place in that country. These events include the continued stigmatization by high-level public officials of critical media outlets and journalists, punitive lawsuits and the dismissal of journalists, and the reported blocking of the internet signal of media outlets." The New York Times Editorial Board published an editorial on September 20, 2014 titled, "Venezuela's Crackdown on Opposition" highlighting among other travesties the show trial of opposition leader, Leopoldo López that has been underway since July 2014. The struggle for freedom and human rights in Venezuela continues.